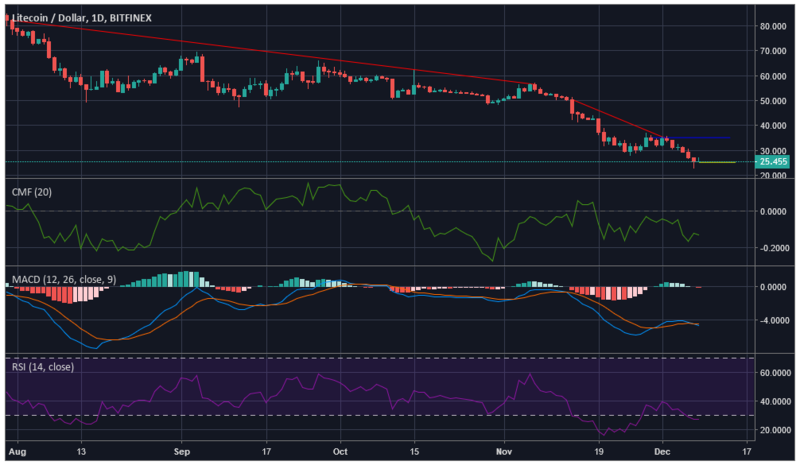 As the market saw constant changes in the top cryptocurrencies on December 7, Litecoin [LTC]’s standing has also kept changing. At the time of press, LTC ranked ninth on the CoinMarketCap list. The coin maintained its position on the top-10 list and was valued at $25.52 at the time of press. The coin registered a market cap of $1 billion with a 24-trade volume of $506 million. The coin plunged by 20.73% in the past seven days. According to the one-hour chart of LTC, the coin saw a downtrend from $31.38 to $22.77. There was a miniscual uptrend seen from $23.09 to $25.38. The coin registered a resistance at $26.31, while a strong support was offered at $22.77. Bollinger Bands appear to be diverging from each other. The market appears bullish as the moving average line is under the candles. Parabolic SAR to marks a bullish market as the marker line appears to be under the candle. Awesome Oscillator, on the other hand, points toward a bearish market is gaining momentum. The one-day chart indicates a downtrend from $82.196 to $56.485 and it goes further down from $50.432 to $34.622. The coin registered an immediate resistance at $35.126, while after seeing such downfall a new support is formed at $25.483. Chaikin Money Flow lies under the 0-line, marking a bearish market, with money flowing outside the market. MACD line appears to be under the signal line right after a crossover marking a bear market. 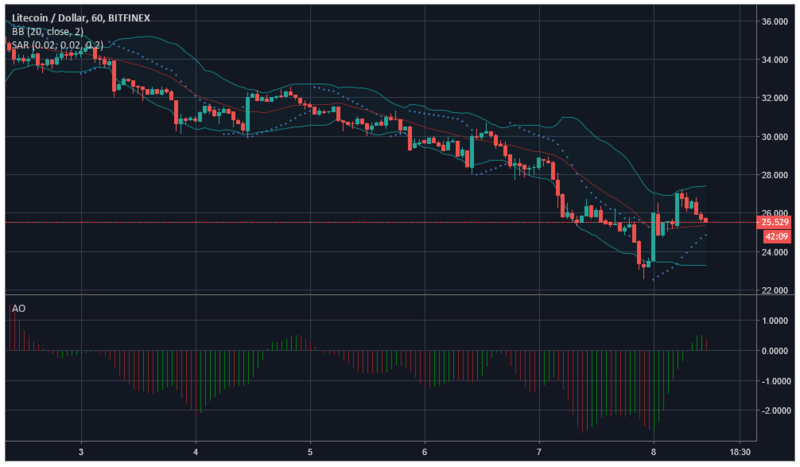 RSI indicates that the coin lies in the oversold zone, making it a bearish market. However, the coin could go for a trend reversal considering the previous trend. According to the majority of the indicators like RSI, MACD, and Awesome Oscillator, the market appears to be vermilion. There is increased volatility int he market as indicated by Bolliger bands.